Over a year ago, Maria Roque became a widow when Güatillo, her late husband, became ill with cancer. To pay for his medical treatment, they sold all of their possessions. A month before his death, Clemente Valladares, a member of the local church, presented him with the gospel message of salvation, and Güatillo made a profession of faith! Iginio (man in photo) was a neighbor and friend of Maria and Güatillo and knew that Maria had no children to care for her, no money, and no home. 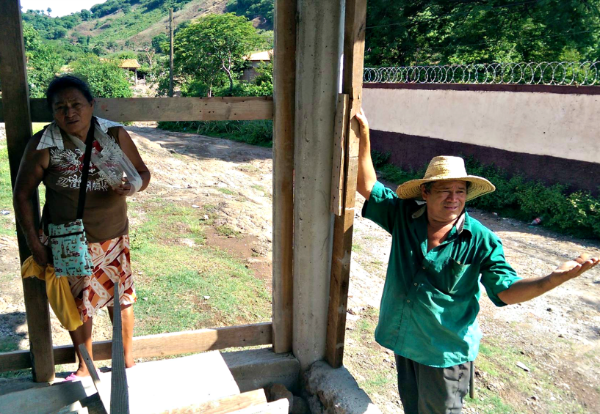 Iginio and his family took Maria into their home and began to build a small house for her. On October 20th, 2016, the members in the local church Getsemaní, Inginio, Angel Gomez and HOPE Coffee started to build a water storage unit (called a pila) for Maria. This will allow her to have water to bathe and clean. Please pray for Maria Roque as she has not yet trusted in Jesus Christ for her salvation. This story illustrates the types of relationships that are created when believers reach out to unbelievers and help meet their needs while sharing the gospel message. Thank you for taking part in this evangelism by drinking HOPE Coffee!